Woodrow House Bed & Breakfast will celebrate its 20th anniversary this year. Business has been good, but I’ve always imagined a guest’s stay should be more than just a place to rest at night. 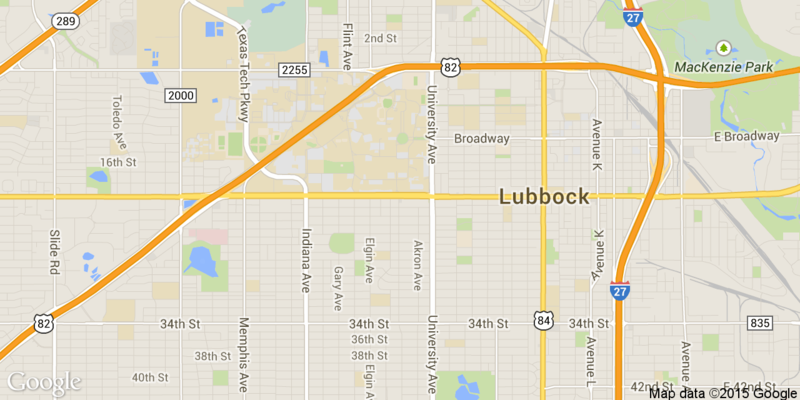 Each visitor’s trip to Lubbock should be an adventure full of good food, fun shopping & exciting excursions to discover art & history. 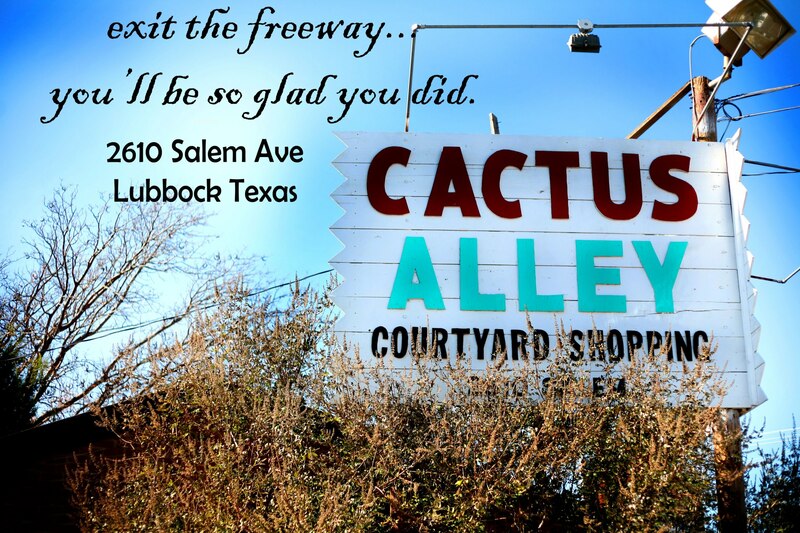 Cactus Alley Courtyard, just off of the Marsha Sharp Freeway & Salem Avenue, manages to roll all of those items into one fantastic stop. “Lubbock’s Best Kept Secret” has been touted as the unofficial Cactus Alley Courtyard Shopping Center slogan for years, but it is really inaccurate. Savvy shoppers in the Hub City are well aware this small, eclectic enclave is home to unique boutiques, shops & yummy food & beverage spots. “There are a lot of rumors about Cactus Alley Courtyard’s past,” according to owner Vickie Glenn. “People will tell you it was a former army barracks, but that isn’t true.” Others will say it was a small apartment complex. Vickie’s understanding of the site’s history includes a story of a local craftsman cobbling together the courtyard one shop at a time for the original owner. The sporadic nature of his work had him making use of materials left over from other jobs, & this resulted in the different bricks that are now a hallmark of the unique structure that surrounds a serene courtyard. “I put the decision into God’s hand & asked Him to help me move on if it wasn’t what He wanted for me,” she said. Her phone rang a few minutes later, & the purchase was a done deal. “It was overwhelming at first,” she admitted. “People were coming to me about broken toilets, & I just had to figure it out.” She will mark her fourth anniversary as owner in June. 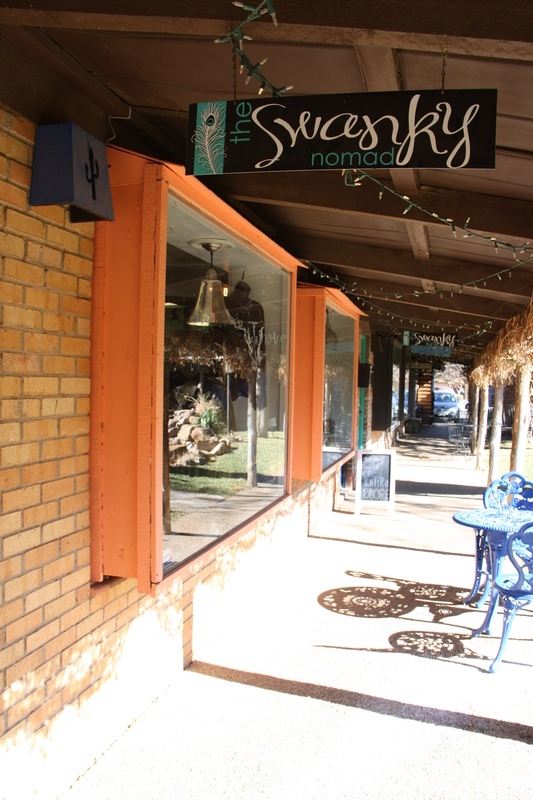 Cactus Alley Courtyard now boasts 12 shops, including with Manna Bread & Wine & Gatsby’s Coffeehouse. I plan to introduce those shops to the followers of Woodrow House Bed & Breakfast over several blogs. The first two businesses I want to feature are The Swanky Nomad & Fragrance of Heaven. The Swanky Nomad is a natural starting point, as it is a companion boutique that has grown to surround Hello Gorgeous. 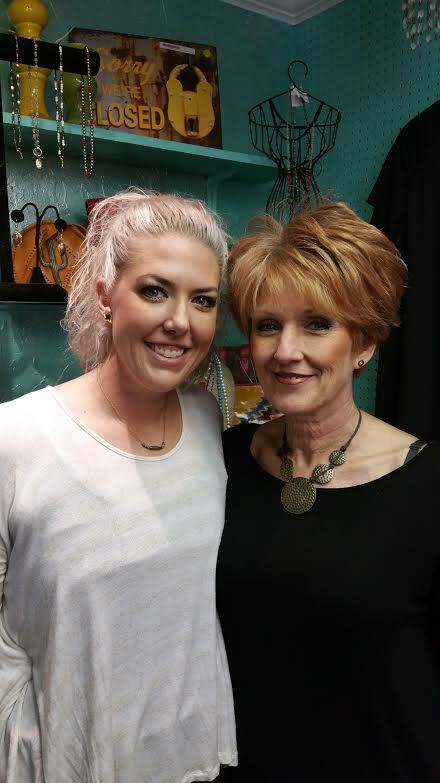 After focusing on hair for many years, Lisa came to Vickie with the idea of opening a clothing store. Vickie liked the idea & volunteered to manage the boutique, leaving Lisa free to focus on her clients. “I have always been a jeans & t-shirt type of girl, but I like getting out of my little box,” she noted. The Swanky Nomad & Hello Gorgeous, located in Suite 6, are open Tuesday through Friday, 10:30 a.m. to 5:30 p.m., & Saturday from 11 a.m. to 5 p.m. Shoppers can keep up with their latest events by following the boutique on Facebook & by visiting their website at www.boutiquelubbock.com; Twitter at @twistedsis6; & Instagram at swankynomad. The boutique’s phone number is 806-784-0084. Terri Arthur began Fragrance of Heaven to be a business & a ministry that combined her passion for pouring high-quality candles & for sharing her faith. The idea was born as a result of her dissatisfaction with candles that lost their fragrance after a very short time, & she decided to try her hand at creating a better product in 2009. Her “recipe” incorporates paraffin & Grade A, uncut oils that are mixed at a higher concentration & poured into a strong & pure candle that burns for a longer period of time. As a bonus to customers, she also makes a small candle in the lid of each candle. It didn’t take long to outgrow her home-based operation, & she went in search of the perfect location. She visited Cactus Alley Courtyard, but the space she looked at was too small. Vickie offered her the opportunity to combine two shops into one – allowing for a showroom & a studio for pouring parties. “I decided to step out on faith, & I knew this was what God wanted me to do,” Terri commented. She signed the lease & settled into the Cactus Alley Courtyard family in April of 2013. Along with the candles, Terri offers a wide selection of crosses & books by Christian author, Rebecca Stevens Crownover. The pouring parties have become a popular way to celebrate special events. One of her first & most memorable events resulted from a visit by former Texas Tech quarterback Seth Doege & his then-fiancée, Abi. They were looking for a unique gift for wedding guests. The couple began playing with fragrance combinations & came up with Pigskin & Prada (leather & white flowers). The parties are priced at $75 per pour & can seat four or five people. Participants can select the fragrance combination, color, name & scripture. The actual pour takes about an hour, participants can then explore the other Cactus Alley Courtyard shops while their candles harden over the course of an additional hour, & then they can take them home. They must refrain from burning the new candles for 24 to 48 hours while they cure. Approximately 80 standard scents are available, & candle sizes include a 2-N-1 Large ($16), Mason Jar ($11), Small ($8), Tarts ($6 – or 3 for $16 & receive a fourth free) & an Air Freshener Kit ($11). Terri’s most popular fragrances include Cactus Alley Cooler, Yaffa & leather blends. Terri also will fill a favorite container for customers for $1.25 per ounce. 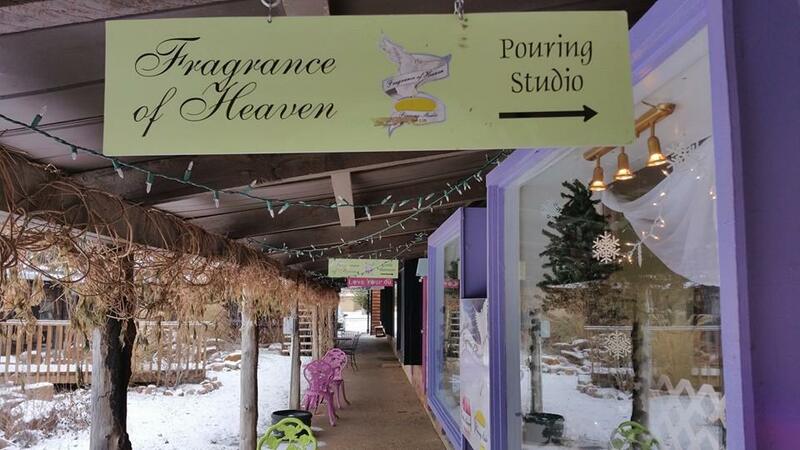 Fragrance of Heaven is located in Suites 12 & 13 & is open Tuesday-Saturday 10 a.m. to 6 p.m., so stop in & visit with Terri. If you don’t find the perfect scent for your home, she will help you create your own signature fragrance. Also, follow the shop on Facebook, through Terri’s website, www.fragranceofheaven.com, or give her a call at 806-549-1679. That management style also influenced the hours for Cactus Alley Courtyard. “I really feel that having a two-day weekend is very important, so we decided it would be best if many of the merchants could be off on Sunday & Monday each week,” Vickie noted. Many shops have exceptions to these days & times, or are willing to extend their hours, so she encourages shoppers to speak with each establishment if they have special requests. Don’t get trapped in retail chain stores! 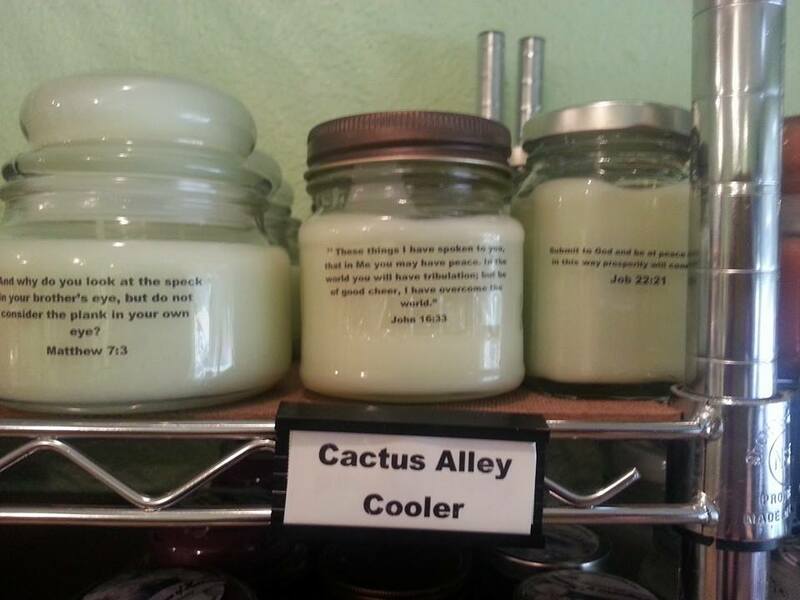 Visit Cactus Alley Courtyard at 2610 Salem Avenue, where you’ll find everything from hand-crafted cheesecake & personalized t-shirts to trendy wigs & original nail art. NOTE: We will feature additional Cactus Alley Courtyard stores soon. Keep an eye out for future blogs with information about more great shopping and dining.